It is basically a sous vide process. I had yet to purchase my Polyscience Sous Vide Professional Immersion Circulator, but wanted to give it a whirl at home. 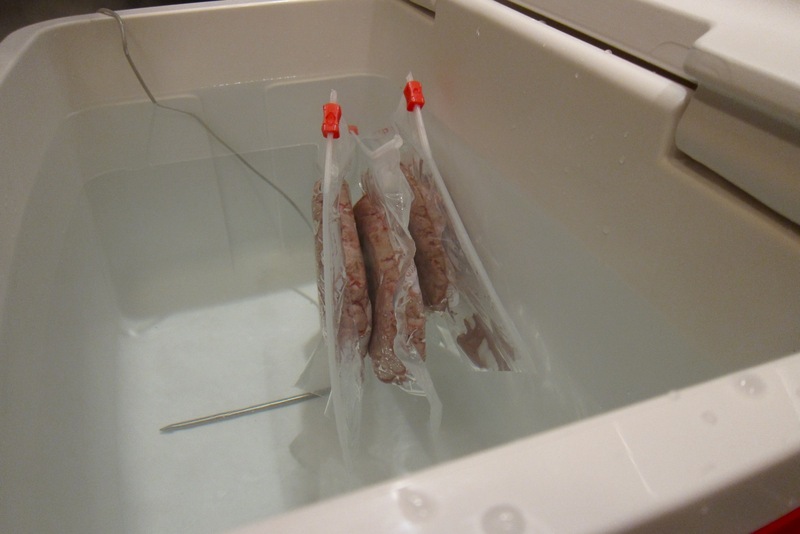 Some googling turned up this awesome phrase: Beer Cooler Sous Vide. You basically use a cooler and a meat thermometer to keep the water temperature in the correct range for a poor-man’s sous vide. This technique should only be used for certain foods, as it is not accurate enough for finessed results, and could cause some problems for long term immersions. But it’s cool for burgers! 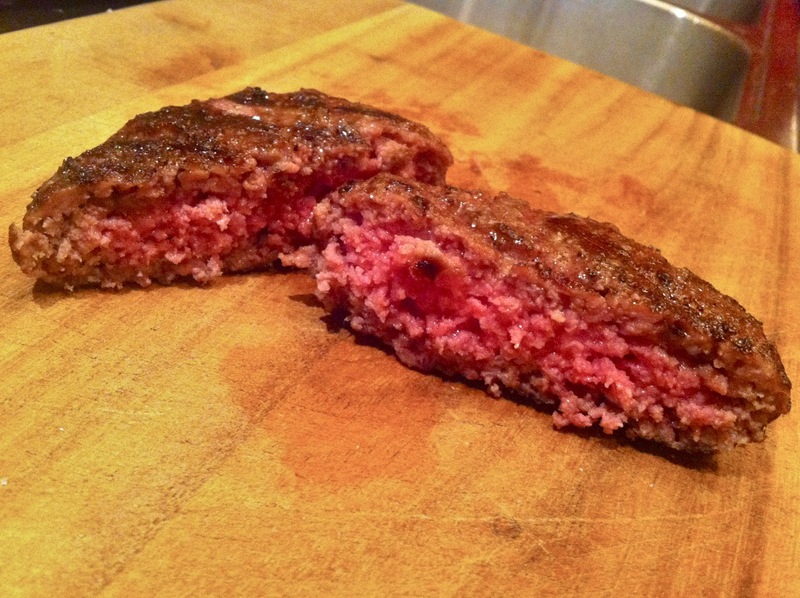 First, the meat – I found this recipe for the Blue Label Burger Blend. 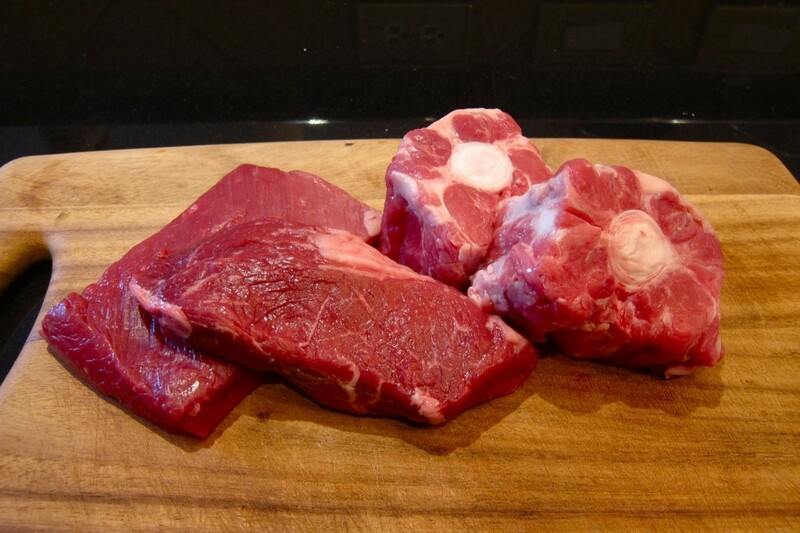 A mix of sirloin. brisket and oxtail. Blue Label Burger Blend: Sirloin, Brisket and Oxtail. Blue Label Burgers pattied out. 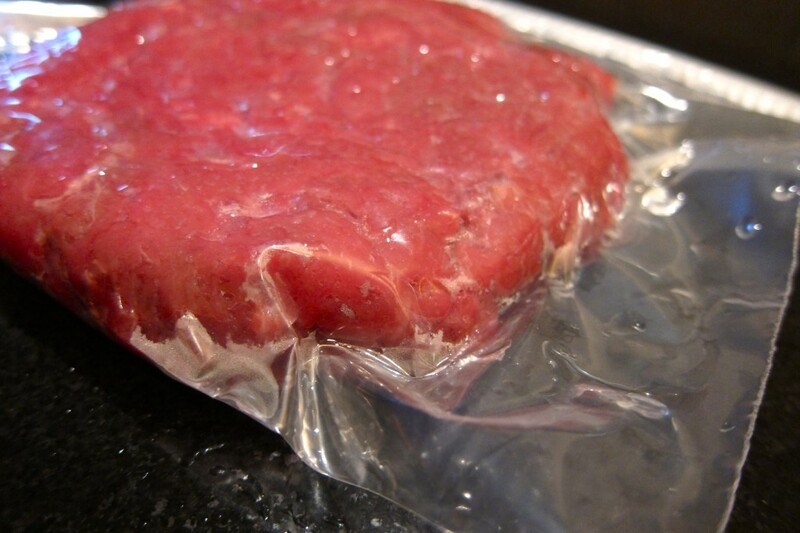 Now that the meat is portioned and pattied, we need to get it into vacuum bags for our sous vide process. 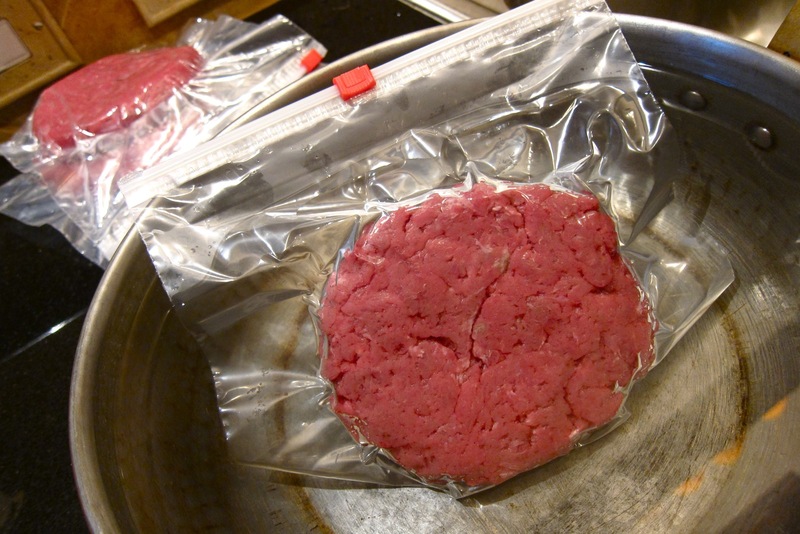 The burgers in individual zip baggies (open). Instead of using a vacuum sealer, here is a great trick: Submerge your bag fully in water and the air is forced out. Seal, et voilà. Easy. 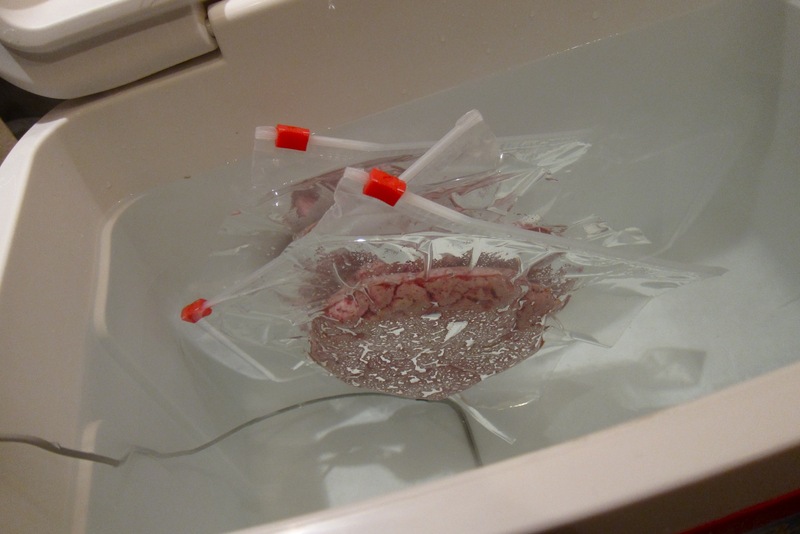 Each bag is slowly submerged in water to force out the air. When the air is out – zip seal the bag. Now we need to get the water up to temp – I was going for “medium” on this batch so went with 140F/60C. The burgers need at least an hour at this constant temp, but they can go for 3 or 4 hours and hold steady there at a perfect medium. Such is the magic of sous vide cooking. 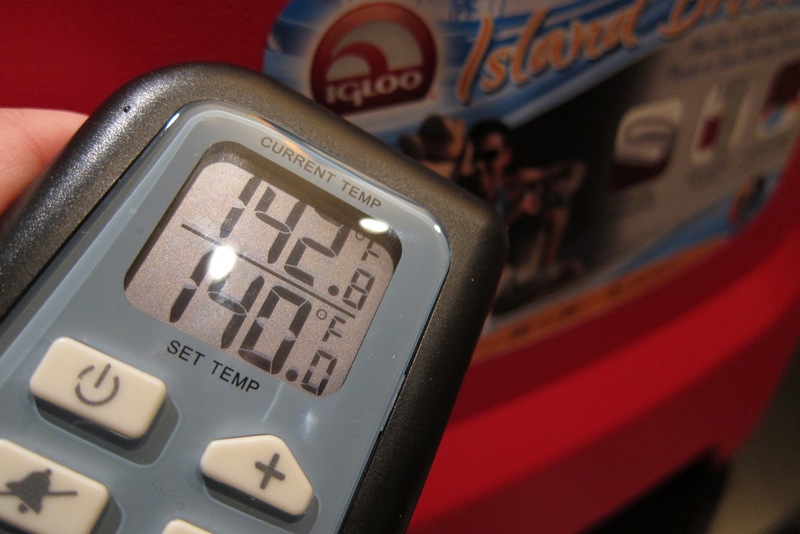 The Beer Cooler Sous Vide bath is brought up the temperature with water heated on the stove. The bagged burgers are introduced into the water bath. With the cooler lid closed, the temperature stays pretty constant – occasionally you will need to slowly add some hot water to bring it back in range and keep it there. The Blue Label Burgers blissfully swim. After an hour or so we have perfectly medium burgers – evenly cooked throughout. To finish them, just throw them on a very hot griddle and sear the outside to get some Maillard Reaction action going! 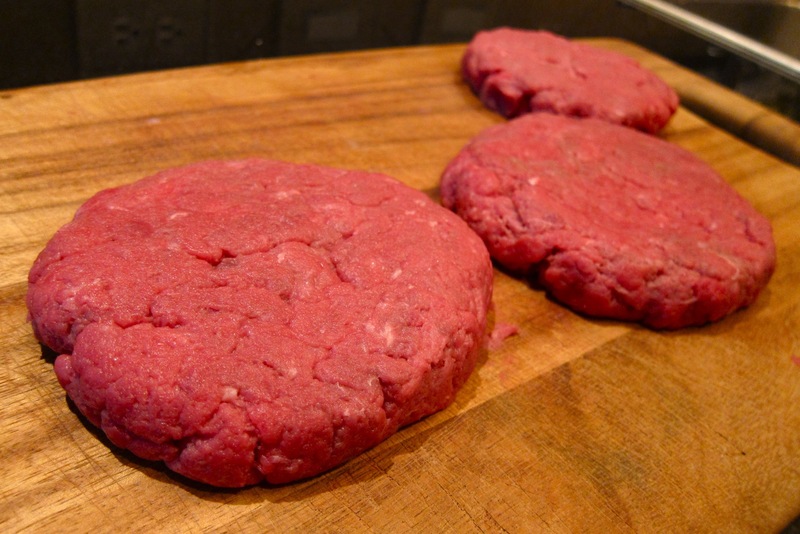 Once cooked through, the burgers are finished on the plancha (hot griddle). Some cheese and homemade gourmet Special Sauce and artisan fixin’s complete the process. 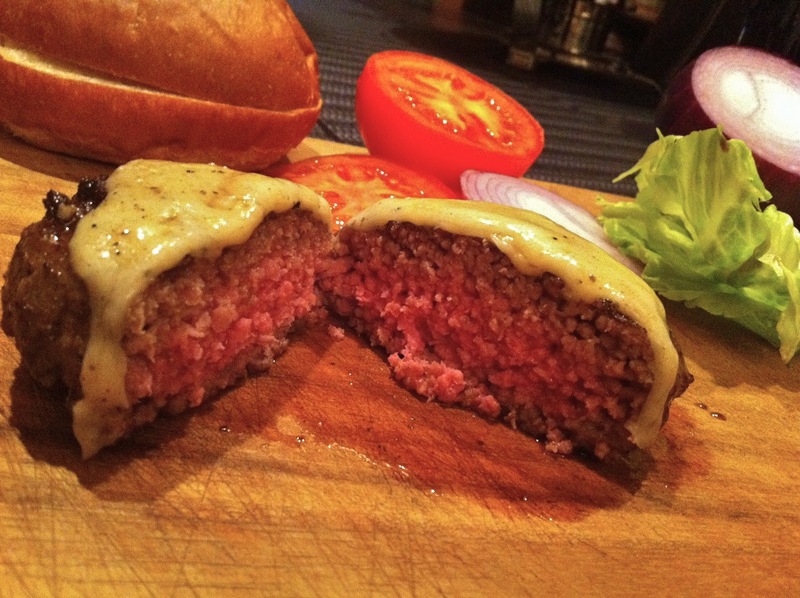 Behold the Blue Label Beer Cooler Sous Vide Burger. The Commissary in One Arts Plaza opened on the 20th, so I ran by and took some snaps of the goods. ^ My pal John Tesar makin’ it happen in The Commissary kitchen. ^ Opening Night: they hit the ground running! ^ The Farmer: fried duck egg and speck on brioche bun with eschire butter and white Vermont cheddar. This is so stupid good – resistance is futile. ^ The Dallas: roasted poblanos and pepper jack cheese and BBQ sauce on a sesame seed bun; ^ The Rib braised short rib, collard greens horseradish mayo on brioche bun. ^ The Magic Burger: aged cheddar, apple wood smoked bacon, lettuce, tomato, red onion and pickles on a toasted English muffin. ^ The Tail End: braised pigs tail, ground pork, ground beef, and topped with roasted pork belly, green tomato chutney and jalapeño mayonnaise on a brioche bun; and the ^ The BIG TEX: ancho chili rubbed, salsa cruda, avocado relish and pickled jalapeños with chipotle mayo on a sesame seed bun. ^ Tempura Onion Rings; ^ Jalapeño Fries – Disco Style (big hit with our table). Another ^ Dallas; and ^ Big Tex. ^ West Coast: lettuce, tomato, avocado, jack cheese and bacon with Special Sauce on a sesame seed bun; and another ^ The Farmer – just because it’s so awesome. ^ KOBE Beef Hot Dog with chili, cheese, onions and sauerkraut; and the ^ Commissary Grilled Cheese: chiabta bread, mezzo seco, cave aged gruyere and fromage blanc fines herbs. ^ Classic Caesar with Parmesan crouton; ^ Paula Lambert mozzarella, vine ripe tomato, basil pesto, and Spicer arugula. ^ Guac; and ^ Parmesan Popcorn. ^ Corn meal fried Oysters; ^ JT’s Mac & Cheese. ^ Tartare Tostada; ^ White Lasagna with fried eggplant and Paula’s ricotta cheese. ^ Mortadella Spuma with grilled Tuscan bread crostini; and a Salumi Plate. ^ some of Sommelier Scott Barber’s selections. ^ The kitchen is open Late Night; and a look at “The Table,” Tesar’s Chef’s Room – coming in May. This place rocks… One Arts Plaza‘s brilliant Tei-An has a cool new neighbor. Life returns to the once dormant corner of One Arts Plaza as The Commissary is born. The space is open and bright in daylight. ^ Barman extraordinaire Michael Martensen has created Wine Cocktails, Sangrias and Punch Bowls. Here he whips up a new concoction featuring some of these excellent selections. ^ JT offers a bite of Kobe Hot Dog. ^ Sliders and Dogs were enjoyed by all. ^ Free Tap Wine and Beer flowed all evening as guests enjoyed the weather and beautiful patio settings. ^ Martensen's outstanding White Tea Sangria – get some! ^ Patrons express themselves. Welcome to The Commissary. Check out this peek at chef John Tesar’s new digs at One Arts Plaza: The Commissary. The Commissary will feature gourmet burgers, small and large plates, wines by the bottle and glass, tap wine, beers, Michael Martensen’s sangria bowls, artisan sodas and a retail wine program. Included is a look at the separate tasting room “The Table,” and some toys in the kitchen. The place should be open in a week or so. See you there! Disclaimer: Friends and followers of my blog are no doubt aware that Tesar and I are buddies. As the concept for The Commissary developed, we collaborated on certain design elements including the logo and signage. I do not do criticism on my blog – but rather champion excellence. My opinion of Tesar as an excellent chef is shared by most anyone who has tasted his food. In that spirit, you will see additional posts about what is going on at this establishment – as you will for many other restaurants I feel strongly about. So, there. Go forth and eat, and support the food you love! A friend turned me on to this one. Not for those that get nose-bleeds easily – but the Tollway can deliver you to Prosper, TX swiftly and with style. Inside there is an ice cream parlor, deli counter featuring Boar's Head meats, and grass-fed beef from Koster Cattle Co.'s own Prosper raised and locally processed Wagyu steers. 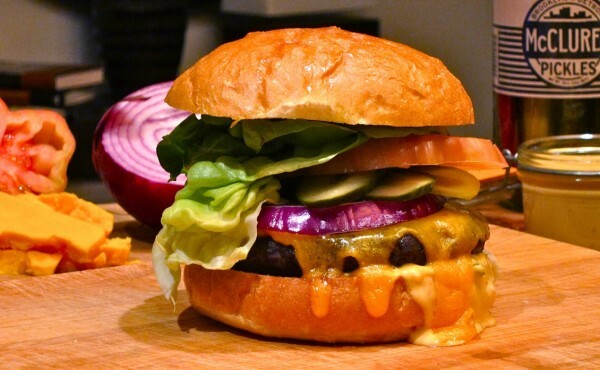 I am here for the "Kosters Famous Kobe Burger – Prime Kobe Beef, Leaf Lettuce, Tomato, Red Onion, Choice of Cheese." The bun is from La Spiga Bakery in Addison. The meat was delicious – really good. It was fun to trek out there and the burger was worthy of the trip. Don't mistake this place, located a bit north of 635 on Midway Rd., for a Scandinavian furniture store – or you'll miss out on a pretty decent burger experience. ^ Fill out your two-sided YourWay Burger order card while waiting in line – it's kinda schtick-y but smart – you are tempted with many options. The combo meal makes for a pretty good deal. ^ Hand over your card, pay and get a buzzer thingy. When your made-to-order burger is ready, hit the condiment bar – lot's of sauces and fresh produce. ^ The burgers are presented in this clever and tidy manner. The Onion Rings went fast. ^ Here's the Chicken Sandwich; and a 1/3 pound Cheeseburger with optional Cheese and Avocado. ^ Here's mine: 1/2 pound cooked medium rare, just as I requested, with chopped jalapeños added to the hand formed patty before grilling – nice concept. With the "Infused Toppings" option, you can have Chopped Jalapeños, Crushed Red Pepper, Chopped Tomatoes, Chopped Onions, Bell Peppers and/or Chopped Mushrooms mixed right into the meat at no additional charge. Carl's Jr is under construction at Trinity Mills and Midway in the former Krystal's location. Don't expect the frenzy an In-N-Out may eventually spawn – but these burgers are pretty good, for fast food anyway. LK is a regular, so she knew that we'd miss the line that normally stretches out the door by heading over on a Sunday afternoon. We did a couple of the the Pepper Jack Cheeseburgers with Bacon, and Grilled Jalapeños – an excellent addition. The patty is hand formed from a fatty mix of beef and the bun – particularly good – crispy-toasted. The Tots were good, but the Fries were rockin'. The place has a fun, dive-y vibe. Along with Sweet Tea, they also offer Jolly Rancher Tea – interesting. It's a "Gob." (Pronounced 'gobb' not 'jobe' for all you Arrested Development fans out there.) Whipped Butter-cream between two Devils Food Cake rounds. Come on – you gotta do it! ^ Maple & Motor during a rare lull. I'll be back for more of these delicious burgers, and am intrigued by the Fried Baloney and the Flat Top Brisket Sandwiches as well. Another benefit of stopping by M&M is that it is across the street from Elliott's Hardware, which is quite simply Tim Allen quality crack for any red-blooded male – bonus! You order at the counter and the VERY attentive staff brings out the goods, offers additional "sauces," and checks up on you from time to time. The manager is also helpful in slotting customers into vacating booths during the very bustling lunch crush. The name? Well, the deal is that they take a ball of loosely ground fresh Angus and "smash" it down on the grill. It makes for a juicy and pleasingly irregular patty. ^ The Mushroom Swiss with a side of the Haystack Onions (thin and crispy, great with the spicy Horseradish dip; ^ and the Spicy Baja Burger – Pepper Jack, Guac, Chipotle Mayo, Fresh Jalps. 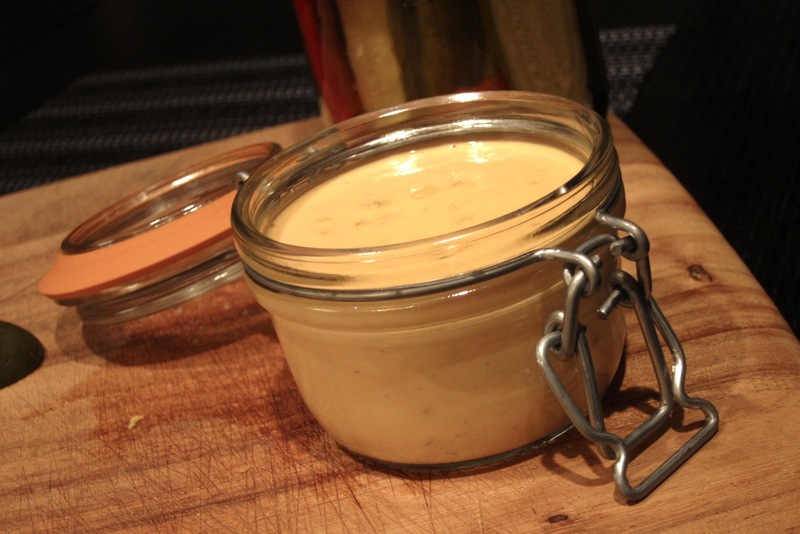 I added "Smash Sauce" for my smashfries – Mayo, Mustard, Pickles, Lemon Juice (you know I love me the condiments). ^ Here are the Sweet Potato smashfries and the gory but delicious smashburger with Beefy Chili added. Both the Potato and Sweet Potato smashfries are tossed with Olive Oil, Rosemary and Garlic… nice. ^ As it was frickin' freezing out, Bob found the open-face Lonestar smashburger quite comforting. I guess we lucked out here, the D/FW version of the menu is a bit more interesting than some of the other locations. Cold weather be damned – we had to try the shakes – served old school. I dug my Strawberry Malt. In the 'skinny burger" category we found these to be really good. They use a seasoning salt on the meat while grilling, though it was a bit heavy handed on the second visit – and I'm not opposed to salty burgers (I adore the Snuffer's variety). Other friends have mentioned having an issue with saltiness at smashburger – you might remind them when ordering – but don't let it stop you from trying this place out.